When making a white cake from a boxed mix, the typical ingredients include oil, eggs and water. If you are looking for ways to customize that simple boxed cake or add flavors to compliment a tropical themed party, substituting mango puree instead of the oil your mix calls for adds flavor and color and reduces the fat and calories in your final dessert. When using mango puree, or any other fruit puree, as an oil substitute, you must consider the amount you use and adjust the recipe as needed. Place your fresh, canned or frozen mango into the food processor or blender and puree to liquid consistency. Set pureed mango aside. Preheat the oven to the temperature your recipe calls for. Combine all your white cake mix ingredients in a mixing bowl as directed on the back of the box. Stop when you reach the step to add the oil. Add the mango puree in place of the oil. When substituting fruit puree for oil in a recipe, use half the amount of oil called for. For example, if the recipe calls for 1 cup of oil, measure out 1/2 cup of mango puree. Add the puree to the rest of the ingredients and combine all ingredients as directed with a mixer or spoon. Pour the cake mixture into a pan and place in the oven. Fruit puree in the place of oil often shortens the baking time required. Check your cake 10 minutes before the recommended cooking time by inserting a toothpick. If your cake mix calls for a 30-minute cooking time, check your cake at 20 minutes. If the toothpick comes out clean, cooking is complete. If the toothpick does not come out clean, check every 1 to 2 minutes until cooking is complete. 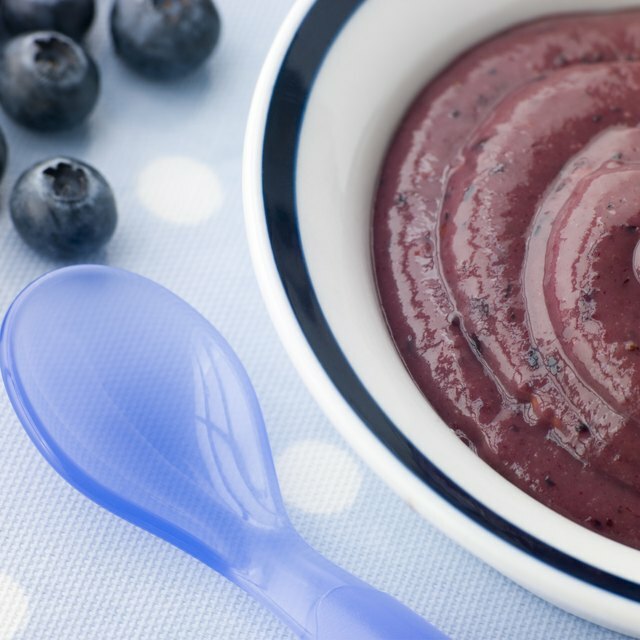 In addition to mangos, other fruit purees to consider include applesauce, pureed pears and pureed prunes. Remember that the addition of fruit purees will contribute to a flavor change. Choose fruits that complement your cake flavor choice. When using a white cake mix, bright fruit purees like mango will also alter the color of the cake. Can You Use Applesauce in Place of Vegetable Oil in Cupcakes? Can You Make a Boxed Cake Without Vegetable Oil?